I have been meaning to go to a comedy club for years but for one reason or another never got around to it, until now. 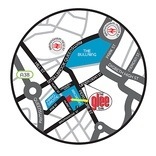 The Glee Club is a popular venue judging by the full house last night but easy to get to in Arcadian Center, Birmingham City Center and parking is ample around the venue too. Tickets are a very cheap £3/head. The Rough Works Night was in the smaller Studio which was packed to the rafters and it got very warm, I wish I had worn a top with short or no sleeves. The bar was conveniently at the back and the venue does serve snacks too. There were two intervals for the night that began just after 7 pm and finished just after 10 pm. The atmosphere at the club was informal and friendly. The audience I have to say were very forgiving of the comics and just out to have a good time. The night was compered by Maureen Younger, whom I was seeing for the first time. She was funny and her comic timing was impeccable. Maureen was very engaging but also put the audience in the mood for some seriously laugh-out-loud comedy. She used the front row in the audience for some well improvised laughs and she was up on stage introducing segments 6 times. Each time she put on a good show and was on form. Next up was Jo Enright who although trying out new material and looking at notes was hilarious. Jo has been on TV and radio but this was the first time I was watching her. She poked fun at death and family and also her Irish roots. She seemed very natural on the stage and engaged the audience as soon as she was up. Jo is back at The Glee Club Birmingham on 13th July 2014. The comics were much funnier than I anticipated they would be as it was a night of trying out new material. There were the anticipated UKIP jokes post-European Elections, but the surprise of the night was seeing Sarah Millican, who was naturally funny but also had her notes with her and seamlessly incorporated reading notes with her act. Having only ever seen Sarah on TV, my husband and I were star struck and delighted. All in all it was a great night even though I didn’t catch the names of the 5 other comics on stage performing new material. There was nothing as formal as a programme so I am sorry I missed names in the roar of applause at the club. If you are interested in going to The Glee Club Birmingham for a Rough Works night the next one is at the end of July. Bookings can be made online. I thoroughly enjoyed myself and can’t recommend it enough as a good night out. Next Next post: Does it ever make sense to judge a book by its cover? Couldn’t agree more Tracey, the atmosphere really made it. I love the Glee Club in Cardiff, it’s a great club. I have seen some brilliant comedians there, like Michael Mcintyre. John Bishop is sold out here at Glee in Birmingham in the Summer, but I will be keeping my ear to the ground for more great comedy nights out.